"O Freunde, nicht diese Toene." 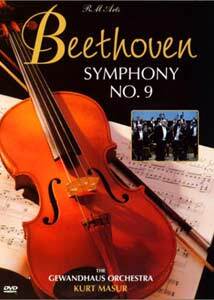 Beethoven's Ninth is of course one of the titanic and most daunting works in the symphonic repertoire. In its successive movements it unites heroism, fate and affirmation, climaxing in the hymn Ode to Joy, taken from Friedrich Schiller's poetry, proclaiming that all men are brothers. The performance by the Gewandhaus Orchestra on this disc is overall quite good. Kurt Masur of the New York Philharmonic acts as conductor, and gives a vigorous reading to the symphony. I don't agree with all of his tempi, however. Notably, the first movement seems to drag terribly, so that the walking bass in the coda sounds as if it is lumbering instead. He does, however, observe most (but not all) of the repeats in the Scherzo, which is all too rarely done. The slow third movement is taken at a surprisingly brisk tempo, which helps rescue it from falling into lugubriousness, as is so often the case. Masur takes far too long a pause between the third and fourth movements, ignoring Beethoven's attacca instructions completely. The reason for the lengthy pause is unclear, since the soloists are brought on stage between the second and third movements. The Finale proceeds with gusto until an incredibly breakneck Prestissimo concludes the piece, leaving the viewer gasping. The vocal quartet is exceptional, both in their solo work and as an ensemble. They are always quite nicely balanced both against each other and against the orchestra. The men also put some expressiveness into their singing, which is all too rarely seen in performances of the Ninth. When tenor James Wagner, during the Turkish March, sings "Laufet brueder, eure bahn,", he acts as if he means every word of it. The chorus unfortunately is not quite so sparkling; their enunciation is badly lacking and the lyrics barely understandable even to one who has heard the piece, literally, hundreds of times. The chorus includes a wing of children, which is probably a significant part of the problem. Why the decision was made for this inclusion is unclear, but it doesn't work well. The camera work tends to be repetitive; about five more cameras should have been used. We tend to sit and watch Masur at lengthy stretches which loses its appeal after a while. He tends a little toward the histrionic and that only entertains so long. Overall, however, a good performance of a great masterwork. Image Transfer Review: The image is better than typical for a live concert. Blacks are extremely deep and rich. Colors are good throughout. While the picture is occasionally a bit soft, it is otherwise excellent. Audio Transfer Review: Both the 5.1 and Dolby Surround tracks exhibit excellent range. A bit of hiss is audible during quiet solos, but overall the noise level is quite minimal. This disc provides an odd circumstance that I actually prefer the Dolby Surround track to the 5.1 track. Even though the 5.1 audio has a broader soundstage, the mix of the DS track is far more pleasing to my ear. The low bass is overemphasized on the 5.1 track to the point of shaking the house, which seems excessive for a dozen celli and a handful of double bassi. The timpani also sounds rather harsh on the 5.1 track. Finally, the orchestra in the Finale is mixed to mask the chorus, making the task of understanding their words even more precarious. The Dolby Surround track suffers from none of these defects, and is quite satisfactory all the way round. There is orchestral sound coming from the surrounds on both tracks, which is not everyone's cup of tea but which I didn't find too distracting here. The A grade is for the DS track; the 5.1 track gets a B- grade. Extras Review: Nothing at all. Nada. Squat. Chaptering is wholly inadequate. The Finale should have at least 3 chapter stops (preferably 5 or 6) but it only gets one here. No subtitles in any language are included, which is a grave oversight, especially concerning the mix for the chorus on the 5.1 track. This disc is about 4 chapter stops away from an F.
Although one can quibble with some interpretive decisions, this is a good perfomance with an exceptional quartet out front. The Dolby Surround track is oddly preferable to the 5.1 track, which is overloaded on bass. No extras at all. Mark Zimmer is Project Director of The Unheard Beethoven, a nonprofit website devoted to making Beethoven's unrecorded music available in the form of MIDI files for free over the Internet.